The Sanyo EM-S3597V features a 23 litre capacity, with 6 power levels and a 1000w grill. Looks smart, with decent construction and performance. None to speak of - more suited to modern looking kitchens than traditional style kitchens. 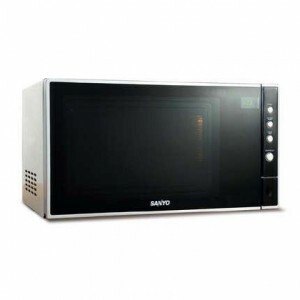 The Sanyo EM-S3597V provides a modest 23 litre capacity, but with a powerful 900w microwave and 1000w grill. The exterior is finished in a black and silver colour scheme, with the controls situated to the right hand side of the appliance. A subtle Sanyo logo is featured on the door. Despite it's small size, it features a whole host of functions - touch control system, 6 power levels, complete with a speed and weight defrost options. The timer is easy to set, and goes up to a maximum of 99 minutes, including the addition of a delay start facility if required. As is standard, a child safety lock facility is also included to avoid accidents. Externally it measures 48.3cm by 28.1cm by 36.6cm, with an overall weight of 13.6 kg. The interior is 34cm by 22cm by 32cm and the cavity has a painted finish for easy cleaning. 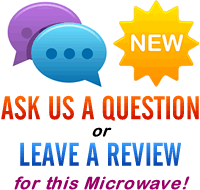 So what did we think of the EM-S3597V silver microwave overall? If you're looking for a small yet powerful grill microwave, then the EM-S3597V model from Sanyo is well well looking at.